The Combined Graduation Ceremony at the NAF’s Regiment Training Centre (RTC) Kaduna equally witnessed the graduation of 6 officers from the Initial Regiment Officers’ Course and 74 personnel from the Very Important Persons (VIP) Protection Course. 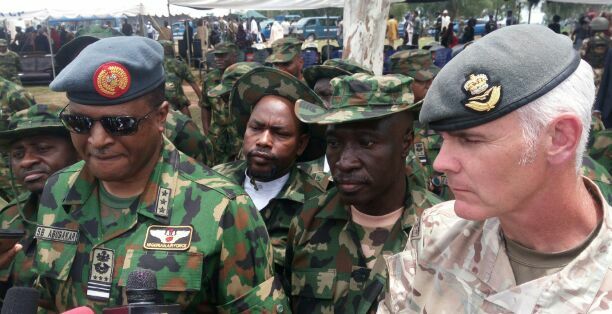 Before the commencement of the graduation ceremony, Chief of Air Staff (CAS), Air Marshal Sadique Abubakar, who was also the Guest of Honour, inspected a static display of Special Forces gears, survival equipment and first aid kits. Thereafter, some of the trainees displayed their newly acquired skills in self defence while others demonstrated their ability to rescue captured colleagues from the enemy’s camps, with air cover provided by a NAF helicopter. The NAF Special Forces also treated the selected audience to a demonstration of an assault attack. The head of the Israeli Training Team, Major Roy, commended the resilience of the trainees, most of whom he said indeed qualified as Special Forces, based on performance. According to him, the impressive performance of the trainees went a long way in indicating the high level of professionalism in the NAF. In his welcome address, the Commandant of the RTC, Group Captain Isaac Subi, gratefully acknowledged the enormous human capacity building efforts of the CAS. He added that the extra effort of inviting foreign experts to come and train students in RTC had added much value to the training capability and stature of the Centre. He then enjoined the graduates to imbibe and make constant use of the lessons from the various courses. Air Marshal Abubakar, who was the Guest of Honour at the Combined Graduation Ceremony, stated that the objective of the Special Forces Course and the other courses was to bridge the identified gap between force projection and force protection. He further said that the exploits of the NAF in projecting air power in the various conflict areas in Nigeria, and even beyond the shores of the country, was not in doubt. He added that the NAF had, however, identified the need to build more capacity in the area of force protection. In addition, the NAF needed to train more personnel that are capable of undertaking special operations, considering the country’s prevailing security challenges of insurgency and terrorism. He therefore thanked the NAF’s partners from Israel for a job well done, noting that the NAF would continue to strengthen the partnership towards preserving the territorial integrity of Nigeria and ensuring the security of Nigerians. The CAS equally seized the opportunity to appreciate the Federal Government, including the National Assembly, for availing the Service the resources to meet its capacity building aspirations, amongst others. The second batch of 150 NAF personnel shortlisted for the Special Forces course would commence training shortly. Director of Public Relations and Information, NAF, air Commodore Olatokunbo Adesanya contributed to this report.